It really doesn't get better than A/B split tests that relate to affiliate marketing. There is nothing more concrete than these tests that will help you make $$$ because these tests are showing you exactly what was done and the results achieved from the changes. All you have to do is choose which can be applied to your landing page and actually put in the few hours of work to test it! These landing pages are exactly the same, just different models. A female model increased the conversion rate by 108%, I wonder what type of improvement they'd see if they used Mélissa Theuriau. Same landing page, except B has a red sticker and red text on the title showing a '15% discount'. Offering a 15% discount, while tripling sales is WELL worth it! Same page, only thing different is the text in the call to action button. A = 'Play right now! ', B = 'Insant Demo!'. I think the word 'INSTANT' speaks for itself. Same page, only B doesn't have the 'secure' icon. 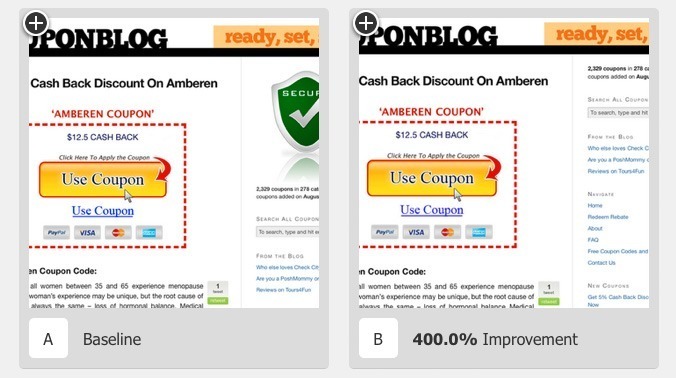 Who would have known 'trust' icons can actually have negative affects on your conversions! The outcome here is video is a greater selling tool than an image. These are the same pages but A = product screenshot, and B = product video! A cleaner more streamlined landing page is what you want! The main differences between these 2 pages are A = cluttered, B = streamlined, with a better call to action. I can't even begin to tell you the amount of times I've made small changes to my ads, landing pages, even my demographics and seen huge increases and decreases in results! Sticking along the lines of positive changes, I've literally turned a $400/day campaign to a $700/day campaign without spending an extra cent! It's all about taking the time to split test and with that in mind, split testing PROPERLY! (5PM) First I'd change my landing page by adding in 4-5 major differences, such as 'trust icons', 'social proof', etc. This is so wrong that it actually hurt my face to type that out!! You need to split test for at least 3 days straight. You need to track it so you can compare conversion rates during different times of the day, etc. No split test at all is better than a rinky dink split test so if you're going to split test, commit to it and do it properly. You'll be surprised by the results.